Little, Brown Books for Young Readers, 9780316199674, 368pp. They needed the perfect assassin. Boy Nobody is the perennial new kid in school, the one few notice and nobody thinks much about. He shows up in a new high school in a new town under a new name, makes a few friends, and doesn't stay long. Just long enough for someone in his new friend's family to die -- of "natural causes." Mission accomplished, Boy Nobody disappears, moving on to the next target. But when he's assigned to the mayor of New York City, things change. The daughter is unlike anyone he has encountered before; the mayor reminds him of his father. And when memories and questions surface, his handlers at The Program are watching. Because somewhere deep inside, Boy Nobody is somebody: the kid he once was; the teen who wants normal things, like a real home and parents; a young man who wants out. And who just might want those things badly enough to sabotage The Program's mission. 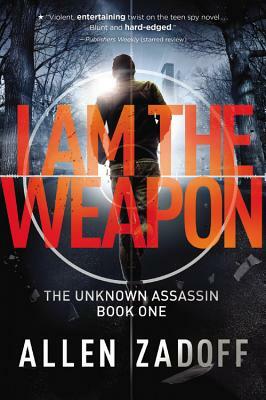 In this action-packed series debut, author Allen Zadoff pens a page-turning thriller that is as thought-provoking as it is gripping, introducing an utterly original and unforgettable antihero. Allen Zadoff is the author of several acclaimed novels, including Food, Girls, and Other Things I Can't Have, winner of the Sid Fleischman Humor Award and a YALSA Popular Paperback for Young Adults. He is a graduate of Cornell University and the Harvard University Institute for Advanced Theater Training. His training as a super spy, however, has yet to be verified. Boy Nobody is being developed as a feature film by Will Smith's Overbrook Entertainment. * "Zadodff shines in this violent, entertaining twist on the teen spy novel. [Boy Nobody is]...a tense and exciting story with a strong cast...blunt and hard edged narration and twists will keep readers riveted."